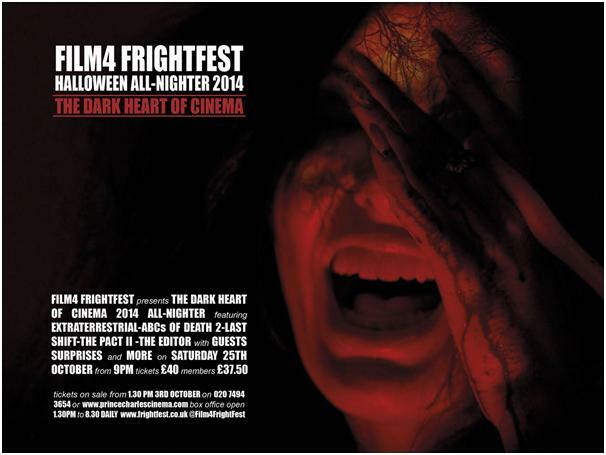 Bring your popcorn and your caffine - Frightfest All Nighter! We kick off with a special preview of The Vicious Brothers EXTRATERRESTRIAL, a fine blend of ‘Close Encounters’ and ‘Communion’ with some of the most extraordinary special effects and camerawork you’ll see in 2015. Next up, THE ABCs OF DEATH 2, needs no introduction. The first was a huge draw at FrightFest Glasgow and now we can scream along to 26 more deaths by 26 handpicked filmmakers. This is followed by the world premiere of Anthony DiBlasi’s demonic horror LAST SHIFT, which had to be dropped from the August line-up because of altered release and completion dates as did our next attraction - the highly anticipated sequel THE PACT II, which has its UK premiere. And Giallo fans will not want to miss our last presentation - the ‘Airplane’ of the Italian thriller genre in the sublime Astron-6 homage THE EDITOR. Get ready to learn your ABC's again with 26 new directors and 26 new deaths. Some of the talent in the impressive mix include Vincenzo Natali (SPLICE), E.L. Katz (CHEAP THRILLS), the Soska Sisters (AMERICAN MARY), Aaron Keshales and Navot Papushado (BIG BAD WOLVES) and Larry Fessenden (HABIT). The follow-up to the most ambitious anthology film ever conceived, Provocative, shocking, funny and confrontational, it’s another global celebration of genre filmmaking. Surpassing the original movie by going into deeper psychological areas to stir up its scares, directors Patrick Horvath and Dallas Richard Hallam's latest episode in the Judas Killer saga once more unfolds a murder mystery linking two intriguing realities that skirt the fine line between being paranormal supernatural and entirely plausible. This time a trauma scene cleaner learns she's the adopted daughter of one of the maniac's past victims and now she's the target of a possible copycat murderer. How an FBI profiler and her cop boyfriend fit into the creepy picture make for neat twists and jolting shocks.